I guess you could say I’ve had a relatively wordless summer as I quietly worked on my stitchery, but it was never been my intention to allow so much time to pass in silence. Yet here it is September and I’m just now posting about some of the delights of my summer. I did manage to find some time to spend at the Koryo Museum. It’s just a little place tucked into the north west corner of the city. 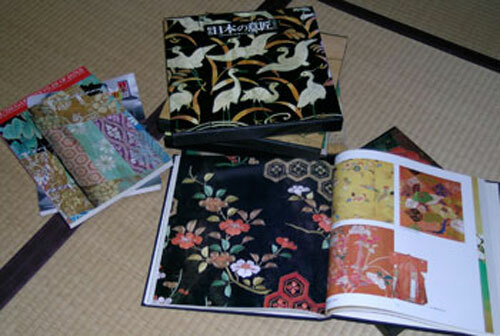 Dedicated to traditional Korean art, their exhibitions are always a delight and this summer’s fare, was lotus-themed art. For this exhibition, they assembled a lovely collection of temple bells, rubbings, etchings, stone work, woodwork, metal work, textiles, paintings and ceramics that each featured the lotus in some part of the design. Though many people are familiar with the lotus through Buddhist art, but the lotus actually has a history that well predates the introduction of Buddhism. Lotus plants are known to have existed in the Cretaceous period (140—165 million years ago) and for at least a millennia, lotus leaves have been used as wrappers, their edible roots and seeds appreciated throughout Asia and ancient literature described its flowers in the most poetic terms. 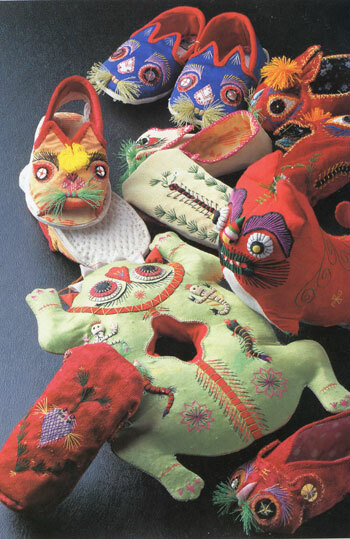 It’s only natural that they would also have become a favorite decorative motif for a wide range of crafts. And as these images were transmitted down through generations, the motif evolved to become an elegant representation crossing through the cultures of an entire continent. 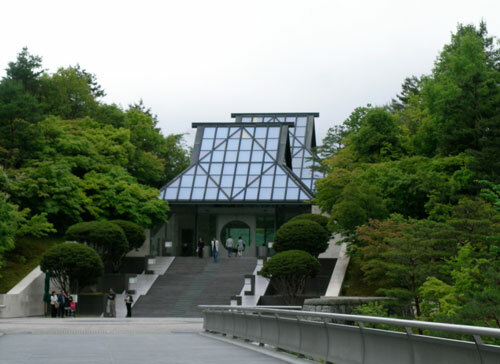 In keeping with its mission to display traditional Korean art, the pieces exhibited at the Koryo Museum were all from the Koryo (918—192 AD) or Chosôn (1392—1910 AD) dynasties of Korea. 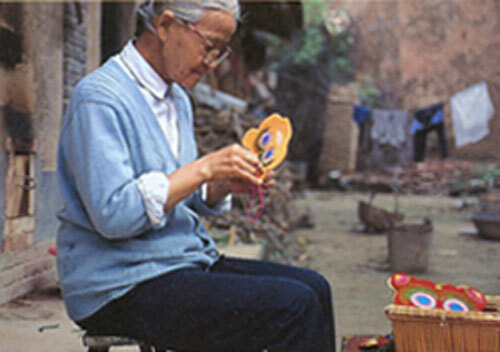 Koreans have always been renowned as particularly exquisite craftsmen and women. 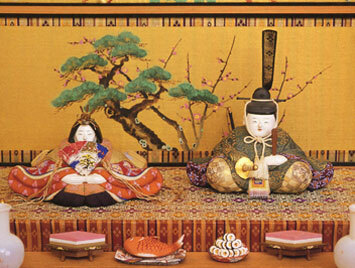 Korean potters, embroiderers, weavers were highly valued in the courts of Korea’s more powerful neighbors, China and Japan.At right is the lovely wood carving that graced the entryway to the exhibition proper, a candlestick in the shape of a lotus plant—it’s broad leaf forms the base, the blossom holds the candle and there’s even a cute little frog crawling up the stalk. Alongside the king, there was a class of men known collectively as the yangban, who helped to govern Korean society during the Chosôn dynasty (1392–1910). 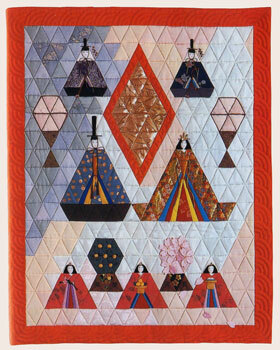 The yangban was comprised of civil or military officials, with civil positions being considered more prestigious. 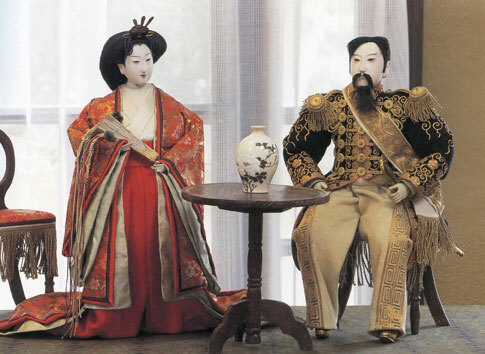 Members of the yangban were expected to hold public office, follow the Confucian doctrine of study and self-cultivation, and help cultivate the moral standards of Chosôn society, in essence, they comprised the literati of Korean society at that time. 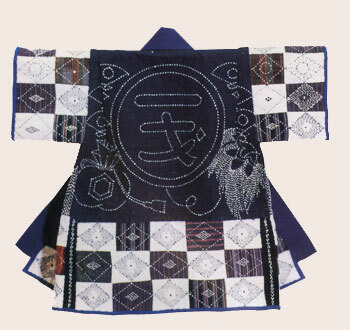 And in keeping with the dictum of self-cultivation, many in the yangban class were accomplished artists, practiced in calligraphy and ink painting, which were traditionally considered the two media most appropriate for the literati. Creating paintings like the image of fish swimming among lotu at left would have been a favorite pastime of this group. 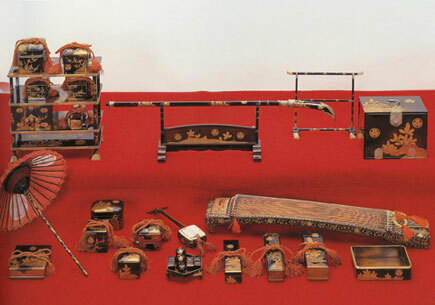 And along with the creating the painting, a proper literati was expected to own an assortment of simple yet beautiful instruments, such as porcelain or wooden brush holders (11.142.1) and porcelain water droppers as well as an inkstone, brushes, and paper. 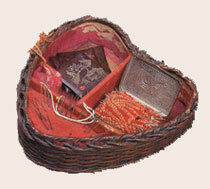 These small accessories, along with refined yet unostentatious wooden furniture, were not only for personal use but also for display as indicators of his station in life. 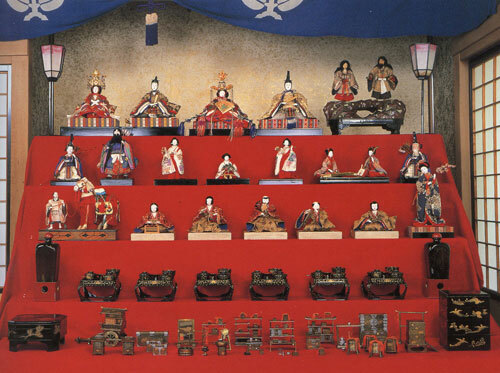 Which naturally led to the commission of even more elegantly crafted items, such as those displayed in the rest of the exhibit. The ceramic flask at right is stoneware, covered with white slip and then carved to expose the darker clay body underneath. 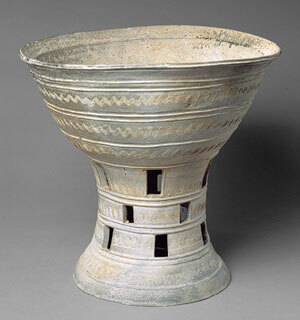 Quite typical of its time, this style is called buncheong ware, and was created in the southern part of Korea. This particular style was quite admired for Tea ceremony in Japan and imported as Korai chawan or Korean teabowls. 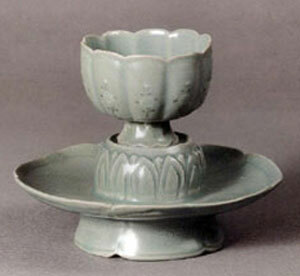 But perhaps the most famous style of Korean pottery would be celadon. 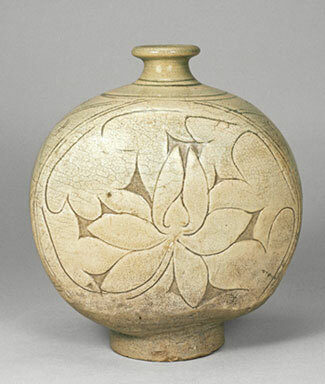 The technique was orginally developed in China during the tenth century and later transmitted to Korea, but as Korean potters adopted and refined the technique, it evolved into a truly exquisite and uniquely Korean form. Of all the art in this exhibit, the teabowls are among the most elegant and refined. The tea bowl and saucer set shown at left was made from a delicately carved clay body, with incised designs that were inlaid red or white clay slip and then coated with celadon glaze and fired. When removed from the kiln, the inlaid slip appeared as white or black beneath the green glaze. On the cup at left you can see faint flower images on each carved petal that comprises the tea bowl, which in turn rests upon a beautifully carved lotus leaf saucer. 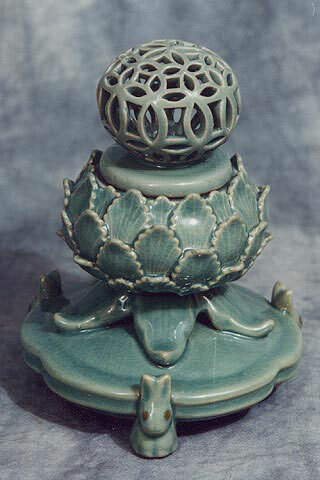 And as another celebration of beauty, this carved celadon incense burner dates from the Koryo dynasty and is thought to predate the teabowl shown above. Although there is only a minimal effort at the incised multi-colored slip inlay, it still features intricate carving and delicate humorous touches such as the “pedestal” of bunny rabbits on which the lotus leaf base rests. Of course, being surrounded with so much lotus inspiration, how could I help but spend a good part of my summer making a bit of my own lotus-themed art? 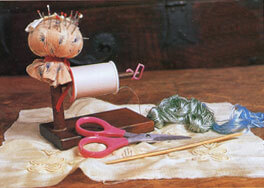 Last month I opened an extension of this site to sell my digitized embroidery designs. 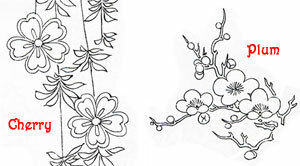 So far, my sets include not only Lotuses but also egrets and morning glories and more yet to come. 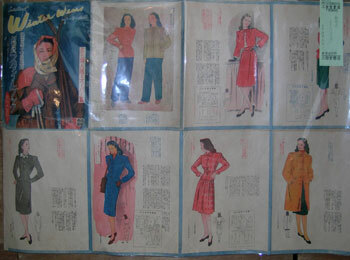 May I invite you to visit my shop next door, simply by clicking here. 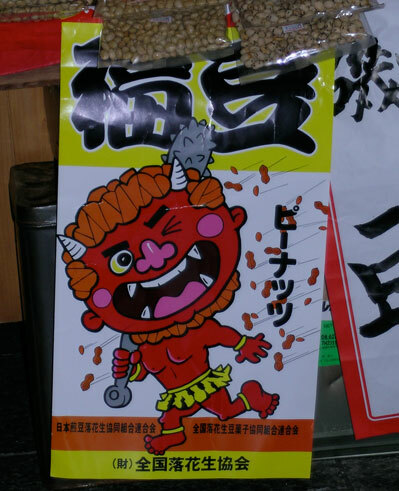 This entry was posted in Korea, Kyoto living on September 6, 2009 by admin. 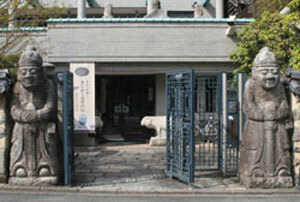 Early in my life here in Kyoto, I had an apartment about two blocks east of the main entrance gate to Heian Jingu. In those days, I worked evenings teaching English and each night I would bicycle home, passing by this gate lit up with flood lights that made the orange glow brightly against the inky blue night sky. And every night, as my heart sang with joy in the presence of such majestic beauty, I blessed the day I had chosen to live in Kyoto. 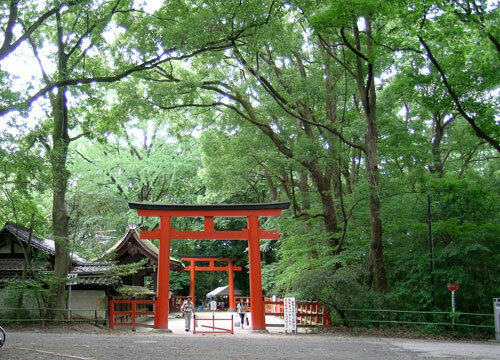 Heian Jingu is an imperial Shinto shrine on the east side of Kyoto. 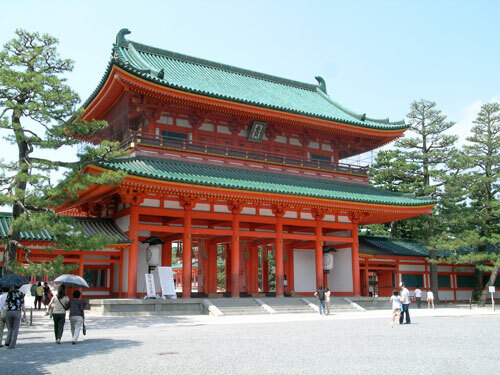 Although Shintoism is the oldest Japanese religion, predating Buddhism by several centuries, Heian Jingu is one of the newest religious structures in this city, having only been built in 1885 to commemorate the 1100th anniversary of the founding of Kyoto as the capital of ancient Japan. After passing through the massive gate shown above, one enters the immense courtyard, only a corner of which is shown in the photo below. 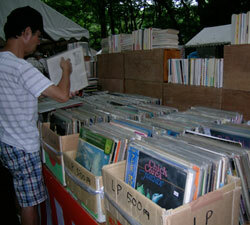 Within the walled enclave of the shrine, it’s easy to loose track of time and place. Inside there are few traces of modern Kyoto or its 1.5 million people bustling about their daily lives; no modern buildings tower above the various halls and shrine buildings that rim the courtyard. 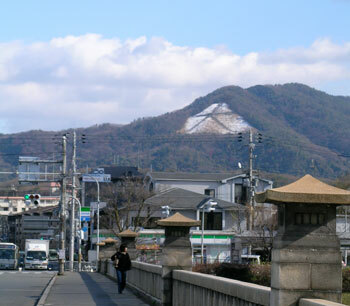 Only a few trees and the eastern mountains appear in the distance. I am told that the shrine architecture is intended to replicate the design of Kyoto’s original Imperial palace, destroyed by fire in 1227, and perhaps that accounts for the overwhelming sense of grandeur that permeates the site. 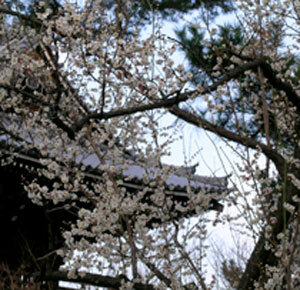 The shrine itself honors two emperors: Kammu (737-806), who founded Kyoto in 794, and Komei (1831-66), the last emperor to live out his reign in Kyoto before the capital was moved to Tokyo. 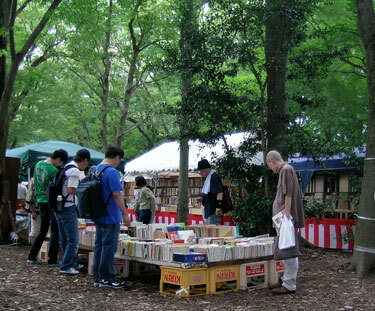 Surrounding Heian Jingu on three sides, there are a series of gardens that are considered the finest of those laid out in the Meiji period (1868-1912). 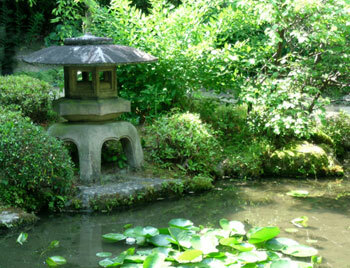 As is typical of such gardens, there are weeping cherries that blossom in springtime, irises and water lilies to nourish the soul during summer and a brilliant pageantry of maple leaves changing colors throughout the fall. This being summer, we are in the height of iris season. 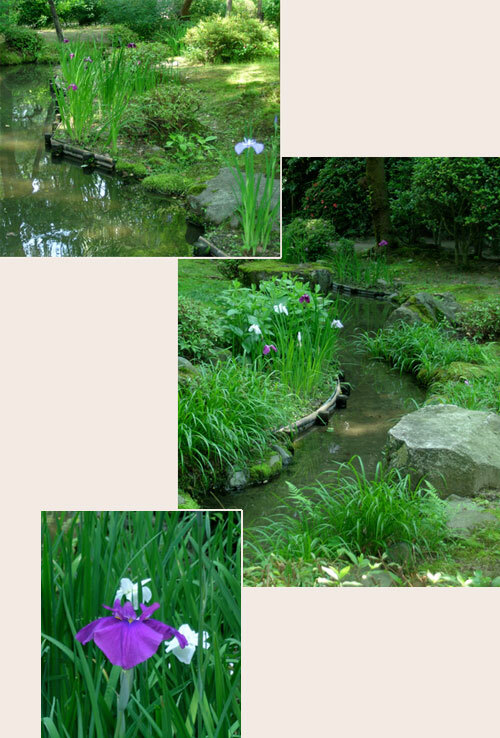 Most Japanese irises today are ornamental water irises called hanashobu in Japanese. 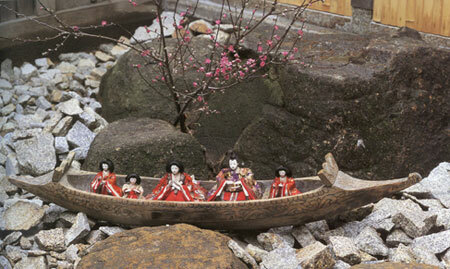 These grow in shallow marshes and along the edges of ponds and rivers, so the network of artificial riverlets and ponds constructed in the shrine gardens provide a perfect venue for these flowers. The meandering pathways that follow the water ways have been so artfully constructed within a relatively contained space that it is possible to wander along without quite realizing that the path has actually doubled back on itself to form a small circuit that can be repeated again and again with the joy of new observations. 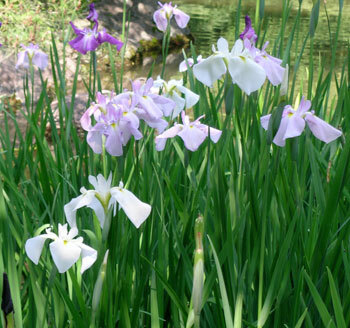 The romance of the Japanese iris stems from Tales of the Ise, a mid-10th century collection of lyrical prose and poems, which among other stories, recounted a heartsick lover composing poetry to a wild iris (called kakitsubata) in place of his lost love. 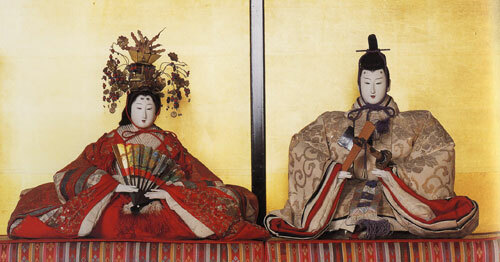 Thereafter, images of wild irises coupled with zig zag wooden bridges became indelibly linked as a romantic motif that was repeated in Japanese art and literature for the next several centuries with some particularly exquisite examples appearing in the 17th century lacquerware and painted screens by Ogata Korin. 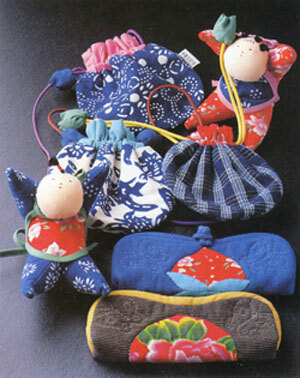 Another interpretation of the iris is suggested by the recently published diary of Abbess Kasanoin Jikun. Entitled In Iris Fields: Remembrances and Poetry, the book is a compilation of essays and poems by Abbess Kasanoin Jikun (1910-2006). 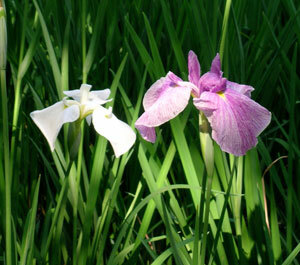 These irises were the ayame type that bloomed at Daishoji imperial convent where she was cloistered. 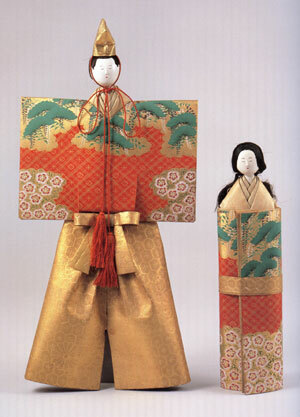 Being a female child of aristocratic lineage, Kasanoin Jikun was sent to an imperial convent at age 5, designated to be raised to become its abbess. Those who enjoyed Memoirs of a Geisha may find an entirely new set of insights into the life of a Japanese woman trained in an utterly different environment for a totally different task during roughly the same time period. 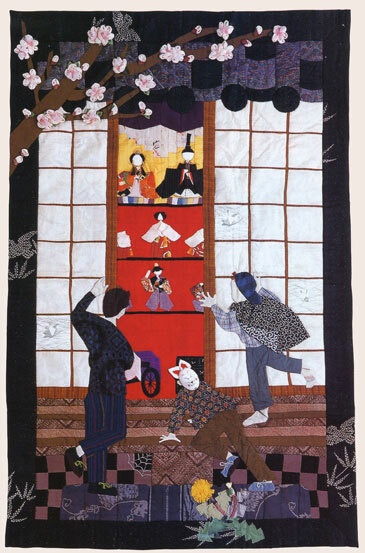 In Iris Fields is a translation of essays and poetry written by the Abbess herself, in which she shares memories of her childhood and stories of her friends and relations as she moved from court to convent during times of tremendous social upheaval in Japan. Those interested in further information about the book should click here. 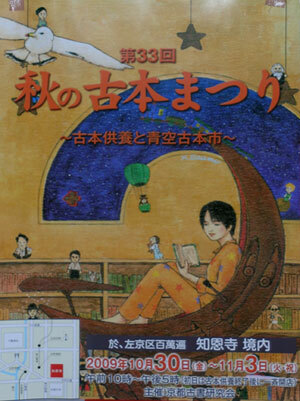 This entry was posted in Kyoto living on June 9, 2009 by admin. 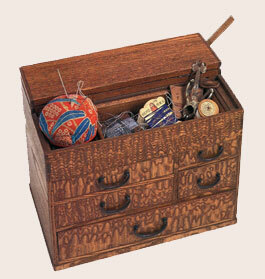 I’ve been working hard of late, busily trying to re-organize large sections of my life. But sometimes you just need to stop for a break. 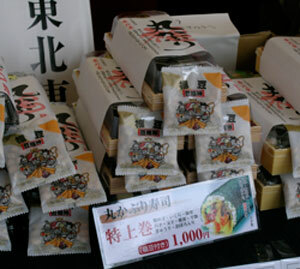 And so when I was invited out recently for a day at the Miho, the seduction of the moment was just to great to refuse. One of the world’s most beautiful museum buildings, the Miho Museum is nestled in the hills of Shiga prefecture about an hour’s drive from Kyoto. Approximately 75% of the building designed by I.M. Pei is actually underground to minimize any disruption to the forested hillside on which it is built, yet the rooftop constructed largely of glass floods the interior with natural light, while the steel crossbeams provide and intricate interplay of shadows across the floors and walls. 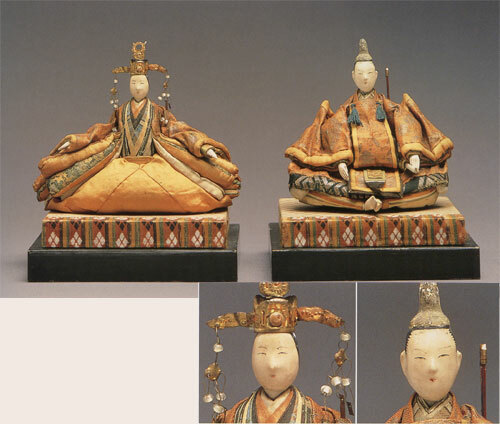 The current exhibit called “Eurasian Winds Toward Silla” focused on archeological treasures from the ancient Korean kingdom of Silla, one of three monarchies that arose on the Korean peninsula around the 3rd century AD. 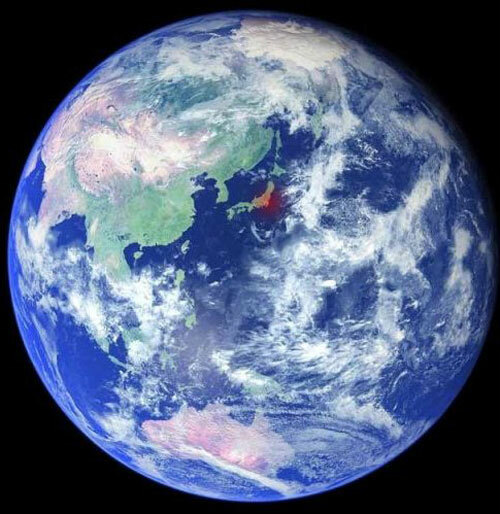 (as shown in the map below) The city of Gyeongju, once the capital of Silla, is now home of the Gyeongju National Museum in Korea, which supplied a collection of artifacts showing the influence of migrating central Asian tribes on the art and culture of the far east. The fall of the powerful Han Dynasty in China around 220 AD had allowed nomadic tribes from Central Asia to roam across northern China and subsequently migrate eastward into the Korean peninsula, bringing with them advanced techniques in glassmaking, metal smelting, pottery as well as Mediterranean and European motifs that had an impact on the early culture of Silla. 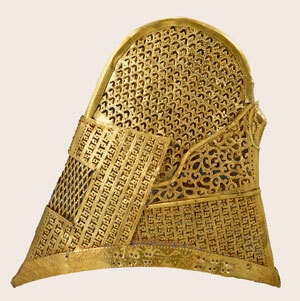 In particular Silla, became known for its intricate goldwork as reflected by the crown shown above and the filligree cap shown below. 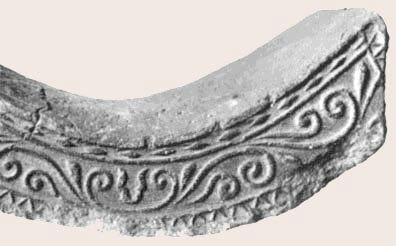 It’s not certain precisely how the crown was worn, but the “duckbill” hanging downward may have formed a visor while the side panels encircled the head. 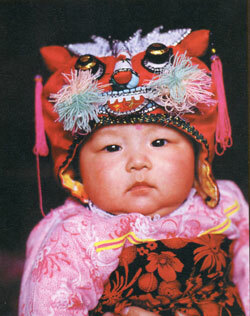 There may have also been some form of cloth head covering that has not survived the centuries. 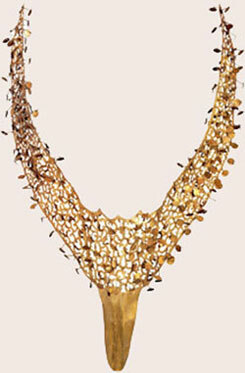 Small pailettes of beaten gold are attached with twisted wires to both sides of the structure, perhaps to emulate feathers or perhaps simply to add shimmering glints of reflected light as the wearer of the crown moved his or her head. 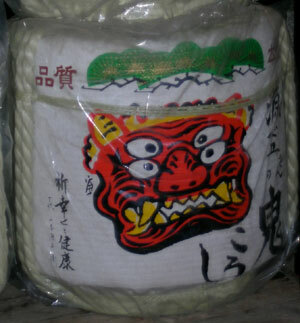 The cap on the right is fairly small object and thought to have been cover for long hair that had been twisted into a top knot. The elegance and skill with which these pieces were fabricated is fairly obvious even in these reproductions and thought to be reminiscent of Scythian goldwork hundreds of years earlier in the region ranging from the Caspian sea to the Baltic coast. As the Scythians were displaced in the around the second century BC, portions of the population moved southward influencing artistic developments in Greece, while other sections of the population migrated eastward across the Asian steppes, bringing their skills to the Pazyrk tribes of Siberia and then downward into China. It was this type of migration, not only of Scythian technology but also that of other Eurasian tribes, that the exhibit attempted to describe through a careful reconstruction and juxtaposition of the archeological evidence. In addition to goldsmithing, the exhibition explored the development of Silla culture through artifacts that included glassware, goblets and other forms of metal work. The introduction of new forms of kilns allowed higher temperature firing of ceramics and the production of Roman-style glass. 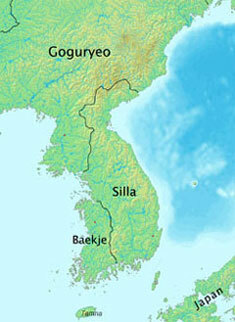 With the rise of the Tang dynasty, Silla was able to form new alliances with the Chinese in order to emerge the victorious conqueror of its immediate neighbors, uniting the Korean peninsula under its rule. And from this powerful new position, unified Silla facilitated the further spread of not only technical processes but also Mediterranean and other east European motifs across two continents to the rim of the Pacific Ocean. 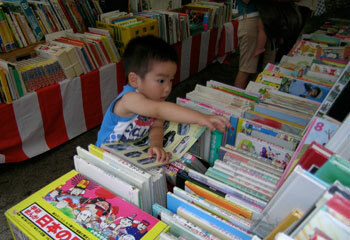 This entry was posted in Korea, Kyoto living on June 1, 2009 by admin.